File this one under things that make you go “Ew.” New York artist Andres Serrano’s controversial series of religious imagery and relics submerged in vats of…fluids…including milk, blood, and in the case of the titular piece here, urine are no stranger to public outcry. Catholic activists in Avignon, the City of the Pope got their pre-Easter bash on quite literally by attacking museum guards and taking a hammer, pickaxe and paint bombs to the Piss Christ photograph on display in the city’s museum. Seems like an awful lot of trouble to go through and get into in order to destroy a photograph. For the record, a 1997 print of the same photo was destroyed by two teens in the National Gallery of Victoria in Australia. The artist, who is a Catholic himself, is clearly capable of simply reprinting his work here, so it seems like all these activists are doing is creating more notoriety and publicity for the image they are trying so desperately to destroy. The work, one of two images vandalised, is known as the ‘Piss Christ’. 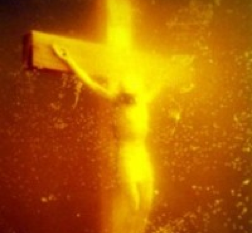 It is a photo of a crucifix immersed in a glass of the artist’s urine and is not new, dating from 1987. It has been on show at Avignon as part of the Collection Lambert since December 2010. Labelled blasphemous by hard-line Catholics, it has angered believers in a number of countries where it has been shown. The attack was preceded by weeks of protest in the city. But don’t just take it from us, here’s a French language news report on the story. Did Piss Christ have it coming? Or should the Catholic protestors practice what they preach and quit their coveting of the artist’s belongings?